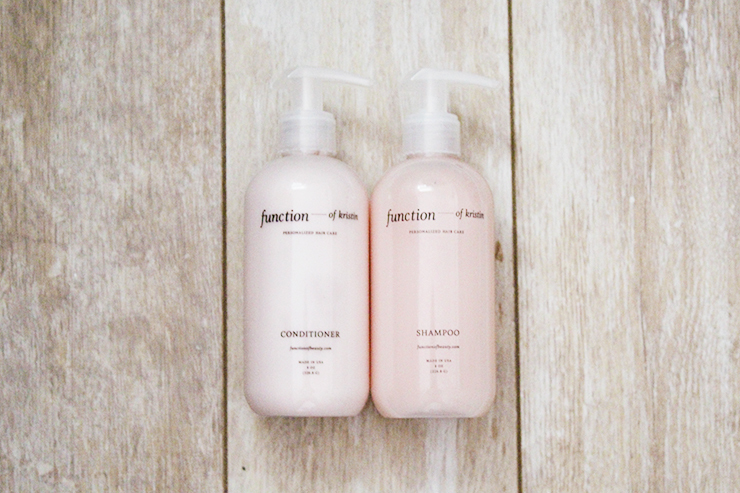 Function of Beauty is a company that makes custom shampoos and conditioners formulated for each individual customer. 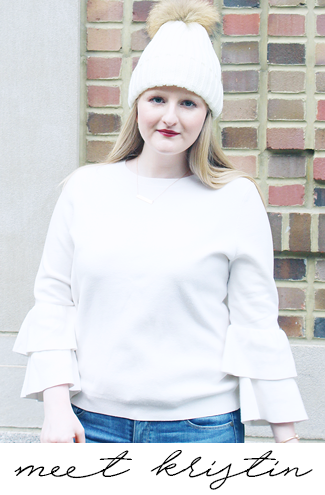 In a world where beauty products are typically mass produced, whether you purchase them at a salon, Sephora, or the drugstore, Function of Beauty's unique approach is refreshing. Moreover, they have made customized beauty affordable and therefore more attainable for the masses, which I think is amazing! To help create your custom shampoo you start by filling out a questionnaire on the Function of Beauty website. The questionnaire asks about your hair type (straight, wavy, curly, or coily), your hair structure (fine, medium, or coarse), your scalp moisture (dry, normal, or oily), and your hair goals (there are a lot of options including deep condition, volumize, shine, and strengthen). You also get to pick out the color and fragrance of the shampoo and conditioner, and name it after yourself! I filled out my questionnaire and my hair goals were to replenish, strengthen, hydrate, and lengthen my hair, and to fight frizz. I also chose pink for both my shampoo and conditioner, and chose passion fruit papaya for the fragrance. I was so excited when my custom shampoo and conditioner came about a week after I ordered them. The first thing I noticed was their adorable packaging, I'm not going to lie I love the idea of having my name on a beauty product! The one downside I found about the packaging though is the pump bottles; you need a lot of shampoo to get a lather and it can be kind of a pain to pump the bottle over and over in the shower. However, once I do get enough shampoo I think it cleans my hair well without drying it out or striping it of its moisture. The conditioner moisturizes my hair nicely, but I do wish it had a thicker consistency; I prefer a thick conditioner so this kind of feels more like a cream rinse to me because it is lightweight. One of my favorite parts about these though is the way they smell, they're super sweet and almost candy like, which I haven't found in hair products before! Overall I'm happy with the Function of Beauty custom shampoo and conditioner, however the next time I think I would make a few tweaks to my questionnaire and hopefully get a thicker conditioner. The great thing is that you can add notes for the chemist that is making your products and tell them about what you want to change. You can also chat with a chemist so they can answer any questions you might have about the products. I think that the people over at Function of Beauty really want to work with customers to make sure they are happy with their products and to help them improve their hair. 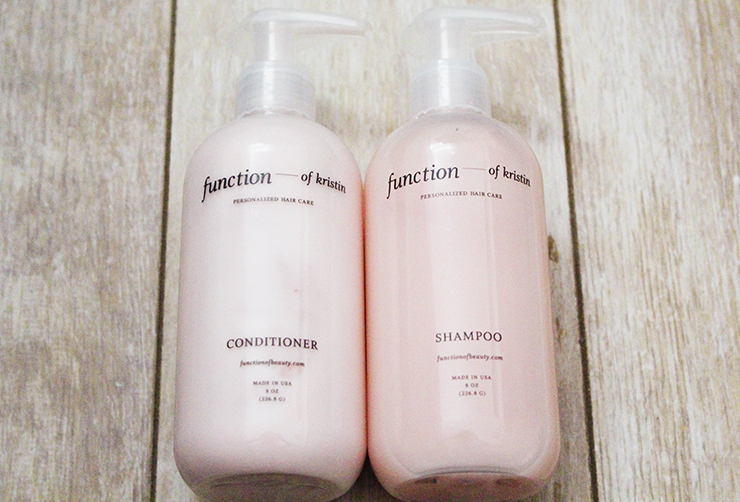 I recommend giving Function of Beauty a try because they have quality products and in my opinion getting your own custom shampoo and conditioner is too fun to pass up! Have you tried custom shampoo or conditioner before? *I was given a gift card from Function of Beauty to purchase their shampoo and conditioner, which I used to facilitate my review, however opinions of this product are all my own. That's really cool! I like that you customize for your needs. This sounds so amazing! I love the idea of personalized shampoos and conditioners. I'll have to look into them. This sounds so cool! I love that you can customize your shampoo and conditioner, I've never heard of anything like that before! This is such a neat concept. I'd love to get my own personalized! These are way too cute! I love their concept!! Such a good idea! I need to do this! That's so cool. I like their concept. Thanks for sharing with us. How fun to customize a hair product and name it as well!! I am all on board for anything I can personalize! Wow! What an awesome idea! They are so pretty too!! Ooh I LOVE the idea of these! I hate how basic the options are in the drugstore because our hair really does need that personalized care! I have never tried custom shampoo or conditioner before but it sounds amazing! The bottles look really pretty too. This is such a cool concept! I can't wait to make my own shampoo and conditioner! I really love that concept. I'd definitely want to make my own shampoo and conditioner - so fancy! And the pale pinks are so pretty. The custom hair care sounds awesome! Love that is has your name on the bottles! Heard so many great reviews on these products! Customized hair care?! How cool! I need to check this out! I had no idea this was a thing. Super cool! Love their packaging. Honestly I would probably buy that shampoo and conditioner just because the packaging is so cute! Love that it says your name on it and you get to pick the color, it can always match your bathroom scheme!